One of the major trends projected for 2019 is the addition of memorable accent pieces throughout your home. You can’t find something completely unique at a department store or large-scale housewares shop. When you’re on the hunt for items that will stand out on any bookshelf or side table, go shopping at a local flea market, bazaar or antique store. Browsing through these shops may take some extra effort, but once you find something you like, it will all be worth it. Experiment with vintage picture frames, clocks, candle holders or bookends with styles and colors that complement your home’s current design. One of the cheapest ways you can revamp your living room is by buying new throw blankets and pillows. You might swap them out to account for different seasons – florals in the spring and plaid in the fall, for instance – or you may want to select unique colors and patterns that look great during all times of the year. If you’d like to follow one of 2019’s home decor trends, you might decide to purchase pillows and blankets with contrasting patterns, colors and textures to create a bohemian, eclectic look. Make sure you keep your current throw blankets and pillows, so you can swap them back in if you’re looking for yet another change a few months from now. Although many homes maintain one uniform style – such as mid-century, retro, modern or Victorian – home decorators have started mixing and matching items from different periods. In the past, your modern glass coffee table might have clashed against your grandmother’s old ottoman. In 2019, placing items of different styles together adds a multidimensional, rich look to any room. You don’t have to spend money to create this trendy look in your home. Ask your family members to see if they have any interesting furniture pieces in their attics that they don’t plan on using. If you’d like, you can even fix up old pieces by reupholstering the fabric or sanding down natural wood to create an intentionally rustic appeal. The easiest way to freshen up any tabletop is by introducing a nice bouquet of flowers. Not only will flower arrangements make your home smell great, they will add enough pops of color to keep your living space feeling bright and cheerful. 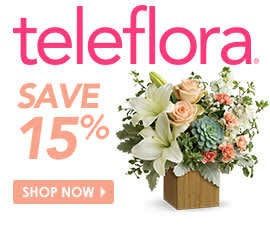 Telefora offers a wide selection of affordable flower arrangements that arrive in unique, high-quality vases you can keep forever. Shop our new arrivals to find a trendy yet timeless bouquet that will add character to any room in your home.